There is much in the Cherry Grove section of North Myrtle Beach, South Carolina that makes the area popular for North Myrtle Beach vacations. From the Cherry Grove Fishing Pier to nearby beach clubs with shag dancing, this family-friendly area of town is wonderful for beach vacations. Tilghman Shores is a North Myrtle Beach resort that is part of the Cherry Grove landscape. 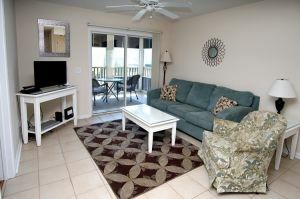 Tilghman Shores C3 is a North Myrtle Beach vacation rental with two bedrooms and two baths. 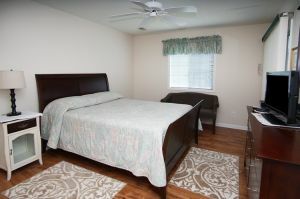 With the sleeper sofa in the living room, this condominium rental can accommodate four people comfortably. Tilghman Shores C3 is in a lakefront North Myrtle Beach resort. Watch the ducks on the water and feel the sea breezes blow in from the Atlantic when you vacation at this North Myrtle Beach condominium rental. 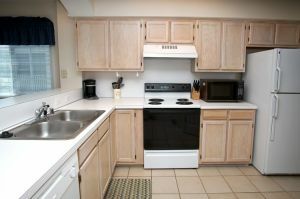 This vacation condominium in North Myrtle Beach, South Carolina has a well equipped kitchen, washer/dryer unit and DVD player. 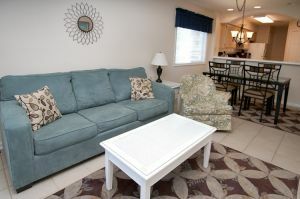 The living room of this North Myrtle Beach vacation rental is a comfortable place to hang out. 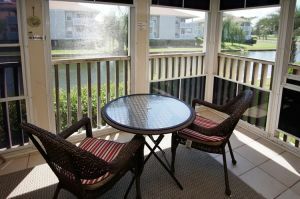 The private balcony of this North Myrtle Beach condo rental is a nice respite from the hustle and bustle of the North Myrtle Beach, South Carolina excitement. Just down the street from this nice condominium rental is a plethora of great things to do during your North Myrtle Beach vacation. Shop the outlet malls. Dine at Barefoot Landing. Cruise the Intracoastal Waterway. Rent Sea Doos and ride the ocean waves. Golf a championship golf course. 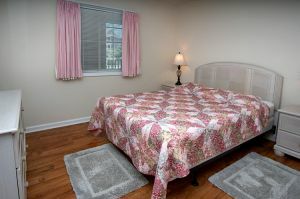 The options are seemingly endless and they are so closely located to the North Myrtle Beach resort of Tilghman Shores. 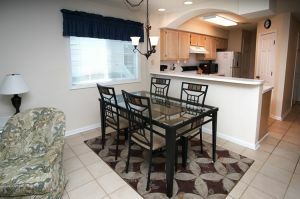 Make reservations for this condo rental in North Myrtle Beach, South Carolina today.